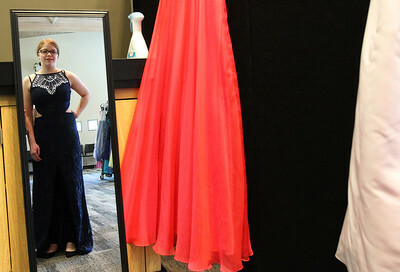 Candace H. Johnson-For Shaw Media Gretchen Hoffeditz, 15, of Island Lake looks in the mirror as she tries on dresses at the Fairy Godmother Shoppe: Prom Dress and Accessory Swap at the Wauconda Area Library. Candace H. Johnson-For Shaw Media Samantha Follett, 15, of Crystal Lake gets some help from her mother, April, trying a dress on at the Fairy Godmother Shoppe: Prom Dress and Accessory Swap at the Wauconda Area Library.Family members Jessica Zeffery, of Wauconda and her daughter, Lilia Arellano, 17, stand close by. 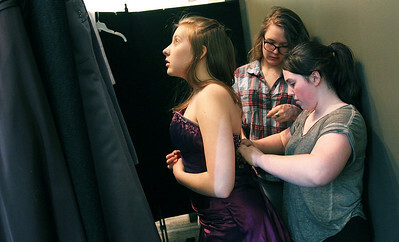 Candace H. Johnson-For Shaw Media Emily Pickering, 17, gets help putting on a prom dress by her friends, Vivian Cossey, 16, and Jade Munch, 17, all of Wauconda at the Fairy Godmother Shoppe: Prom Dress and Accessory Swap at the Wauconda Area Library. Candace H. Johnson-For Shaw Media Vivian Cossey, 16, of Wauconda talks to her friends in one of the prom dresses she picked out at the Fairy Godmother Shoppe: Prom Dress and Accessory Swap at the Wauconda Area Library. 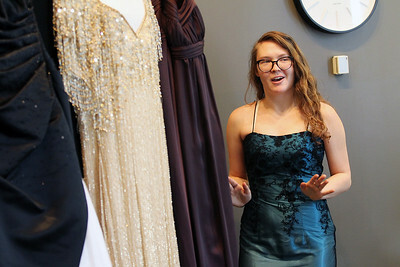 Candace H. Johnson-For Shaw Media Samantha Follett, 15, of Crystal Lake peeks out of the dressing room to see what dresses her mother, April, has brought her to try on at the Fairy Godmother Shoppe: Prom Dress and Accessory Swap at the Wauconda Area Library. Candace H. Johnson-For Shaw Media Lilia Arellano, 17, of Wauconda gets some help from her mother, Jessica Zeffery, as she picks out a handbag to go with her prom dress at the Fairy Godmother Shoppe: Prom Dress and Accessory Swap at the Wauconda Area Library. 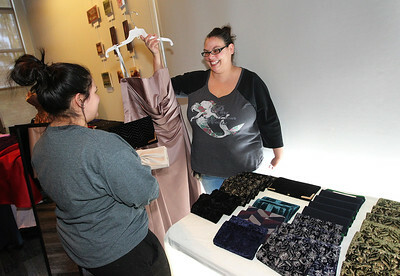 Candace H. Johnson-For Shaw Media Chelsea Hernandez, 15, of Wauconda looks for a prom dress at the Fairy Godmother Shoppe: Prom Dress and Accessory Swap at the Wauconda Area Library. 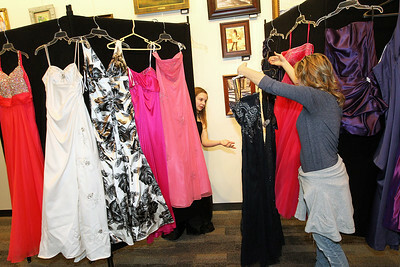 Candace H. Johnson-For Shaw Media Gretchen Hoffeditz and Annaka Norland, both 15, of Island Lake look at dresses at the Fairy Godmother Shoppe: Prom Dress and Accessory Swap at the Wauconda Area Library. 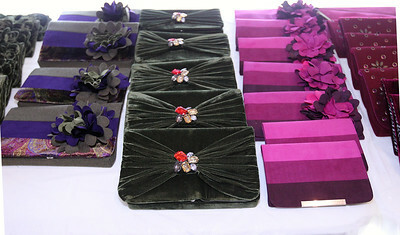 Candace H. Johnson-For Shaw Media Handbags to match beautiful prom dresses were set on tables at the Fairy Godmother Shoppe: Prom Dress and Accessory Swap at the Wauconda Area Library. 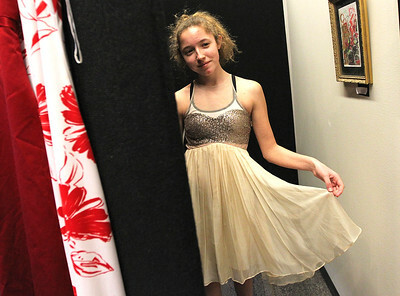 Candace H. Johnson-For Shaw Media Tatiana Gmitrovic, 14, of Wauconda shows off a dress she has tried on at the Fairy Godmother Shoppe: Prom Dress and Accessory Swap at the Wauconda Area Library. Candace H. Johnson-For Shaw Media Shoes to match the perfect prom dress were set out on tables for girls to choose from at the Fairy Godmother Shoppe: Prom Dress and Accessory Swap at the Wauconda Area Library. Shoes to match the perfect prom dress were set out on tables for girls to choose from at the Fairy Godmother Shoppe: Prom Dress and Accessory Swap at the Wauconda Area Library.